These documentaries reveal the sad and horrifying reality behind the meat industry. 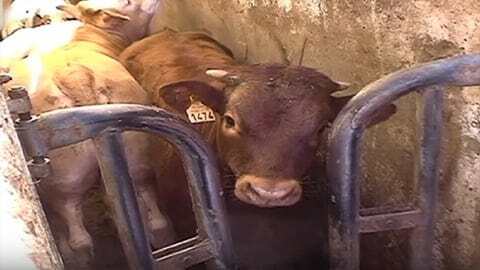 The following videos show the lives and deaths of the animals who are tortured for their meat. If it's not good enough for our eyes, why is it good enough for our stomachs? 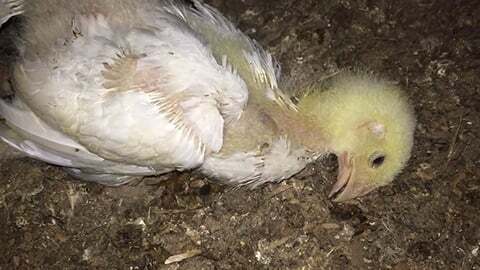 A shocking video that captures the horrors baby chicks endure during their first day of life - THROUGH THEIR EYES. Though it's hard to believe it, all of the scenes in this powerful video are legal. Watch the shocking findings of a thorough investigation into hatcheries that breed chicks for both meat and eggs. These lambs have to see their friends get killed before their own eyes. Watch how one of the largest slaughterhouses in Germany kills cows before selling their flesh as bio meat. This is how workers in Spain treat baby lambs during a routine day. It's hard to imagine places like rabbit farms exist unless you witness it with your own eyes. In order to meet the holiday demand, meat farms kill baby pigs when they are babies. As can be seen in this video, what sows and their babies go through in pig farms is beyond words. The things done to piglets on pig farms are hard to believe unless we see them with our own eyes. A close up view of what ducks go through just before their flesh ends on people's plates. Some think that in Europe animals live a happy life, but as this page shows, this is far from the truth. You won't believe what pig farms do to baby pigs unless you see it with your own eyes. Although the killing of days old babies is horrific, in our world it's a symbol of celebration. Do you dare watch what pig farms do to baby pigs soon after they are born? 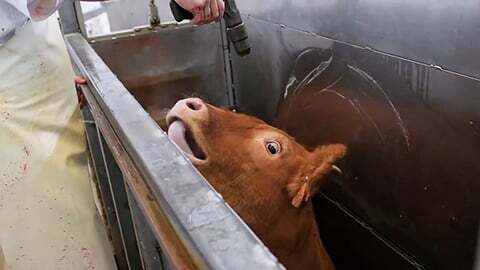 Do Animals Know they are Going to Die? This video conveys what it must feel like to know you're about to be slaughtered. This video shows how a high-speed slaughterhouse in the U.S. operates during a routine day. Eating a turkey at Thanksgiving dinner is a 2nd nature to many, but what really hides behind this old custom? Watch what some countries do to pigs when there is a fear of virus infection. What exactly do we pay for when we buy meat? The words of Gary Yourofsky are so powerful. The story of the white cow is one of the most powerful stories ever told. It's impossible to remain indifferent when watching this video. Nothing humane has ever happened on a pig farm, even if the farm would like you think this way. This shocking video reveals the horrors chickens go through before their flesh ends up on plates. If we knew more facts about sea animals and fish in particular, would we care more? Learn how these sea animals see the world. This is what newly born baby turkeys have to go through soon after they hatch. This heartbreaking video shows a baby lamb chasing his mother shortly after she was killed for meat.